This chapter is entirely devoted to hermeneutics. 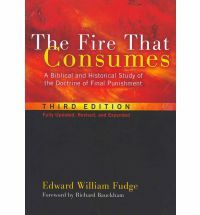 Before Fudge tells you what he thinks the Bible is teaching about hell (or any subject for that matter), he lays out his hermeneutical methodology, and spends a good amount of time talking about the hermeneutical baggage that many protestants carry with them when they, er, uh, “read the Bible for what it plainly says” (heh!). “a willingness to read Scripture, taking into account the ways in which it has been read in the past … It is a willingness to give full weight to the views of those who have gone before us in the faith, providing forceful reminders of the corporate nature of the Christian faith” (p. 9). Why does Fudge want you to do this? Because Christians across the centuries of Church history have not always read the texts or understood them to mean the same things we understand them to mean today. But there’s more! Fudge believes (and I agree with him) that sometimes (often!) hermeneutical work being done by devotees of particular teachers or traditions devolves into loyally but uncritically repeating what those within our tradition have taught us. And why would they teach us the wrong things? More than that, why would we believe anything wrong? Who would do that? Not me! Maybe you, but not me! “…proper appreciation for the thinking and conclusions of those who preceded us does not free us simply to rest on insights of those who went before, nor does it require us to accept as final whatever the church has taught in the past” (p. 9). It is a fallacy to believe that the reformers finished the work of reformation. Fudge believes that it’s time to ask serious questions about our hermeneutical methods and conclusions around the biblical teaching on hell. I strongly recommend you give his work a read with an open heart and fresh eyes. While you’re waiting for your copy to come in the mail, or to download to your kindle, you can watch Dr. Fudge here as he discusses the basics of his conclusions. He’s like your grandpa from Texas who also happens to be a biblical genius! Okay – if you want to buy your own copy, click the green button and shop away. Uh – wow! Dr. Fudge, how great to have you stop by ThinkTheology.org. What an honor!! I’d like to contact you and invite you to do a written interview with us here about… well, HELL!! We’d love that. I don’t mind sharing my email here if you’d like to get in touch and we can discuss particulars. In the meantime, I invite your input and critique of some work I’m doing on the parable of the Rich Man and Lazarus for a seminary project. I am interpreting the parable NOT as a teaching about Hell (as the parable of the sower, seeds, and soil is not a lesson about “Farming the Jesus-Way”), but rather as a polemic against the Pharisaic interpretation of Judasim and its utter incompatibility with the message and way of Jesus (utilizing some after-life imagery and ideas to make the point). Anyway, since that parable is often used to teach what hell is like, I thought you might be interested. We wish you peace and all good, sir! The secret formula of the saints: When I am in the cellar of affliction, I look for the Lord’s choicest wines.